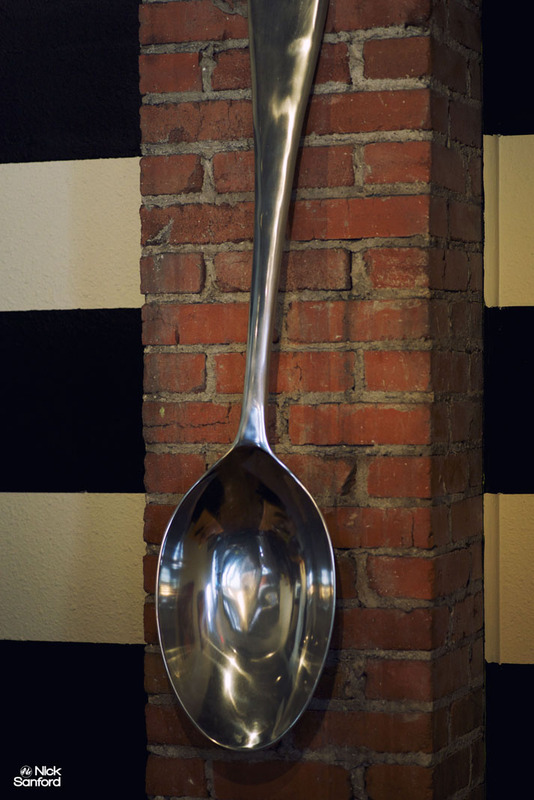 Brick And Spoon embraces what brunch is all about. 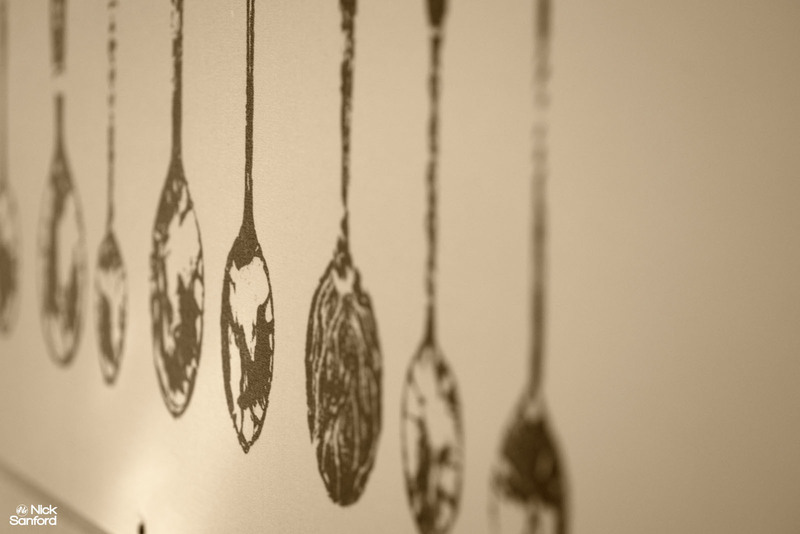 It’s open from 8-3PM every day, where they focus on a Louisiana style brunch that becomes a journey into brunch heaven. It’s located at 1312 West Alabama in Houston Texas. When you arrive here, you may have to wait a little while, because they don’t do reservations over the phone. Be aware of that. On Sundays they have live music here in the front room area, which gives Brick and Spoon a really nice relaxed atmosphere and some tunes to go with it. 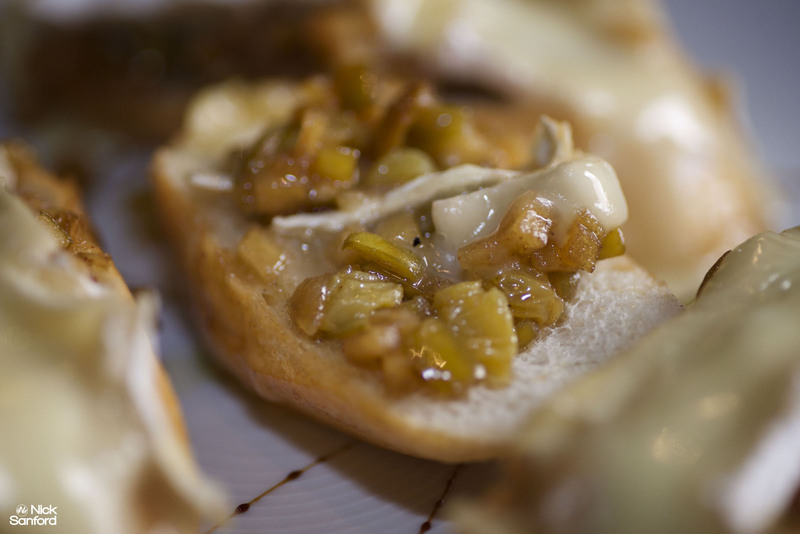 The minute that we had our appetizers which consisted of the baked brie bruschetta which is a dish made of caramelized apples, golden raisins, pecans, balsamic reduction, and the brie cheese that makes this taste really unique. The brie cheese gives it that balance of bitter and sweet as you chew this thing apart. The Bananas in Pajamas was a fun starter here as well. Crispy banana eggrolls served with Fosters sauce. Really nice well cooked and crispy on the outside and a delicious creamy filling of bananas that has the smooth Fosters sauce that coats the outside of the eggroll. 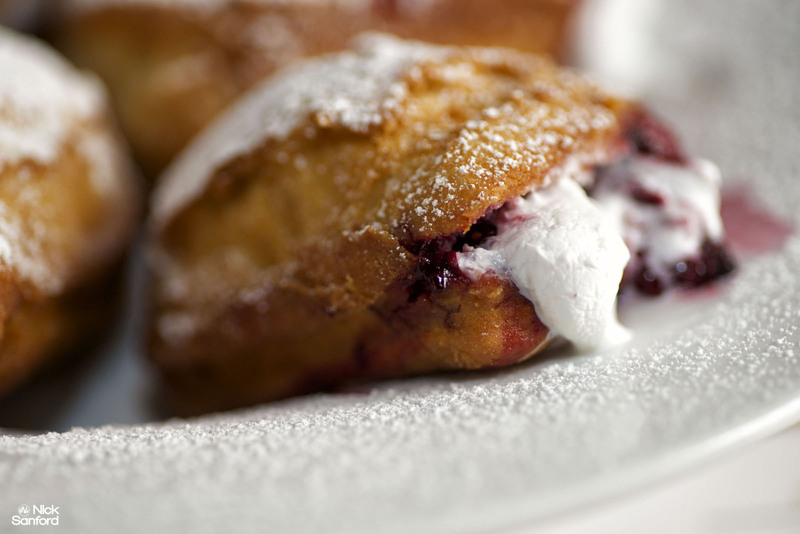 The powered sugar and wildberry creme stuffing beignets were about as outstanding as they could have possibly been. The bread was baked to perfection and had a nice crispy exterior that opened up a moist inside filling of wild berry crème stuffing that hits the spot completely. 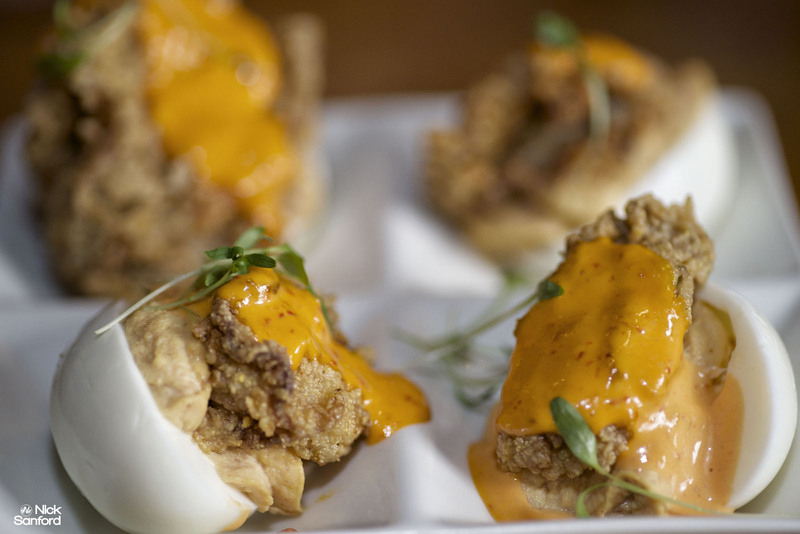 The appetizer that totally made put us in a food trance was the tasson deviled eggs topped with fried oysters and Sriracha Aioli. The appetizer is known as “Deviled on the Bayou” on the menu. There are a lot of restaurants that are doing crazy fried oyster deviled egg mixtures, but this is by far the best one I’ve had yet. The oysters are huge, and the sauce gives it that Louisiana twang to the flavors that just puts a smile on your face. This isn’t just a party in your mouth. 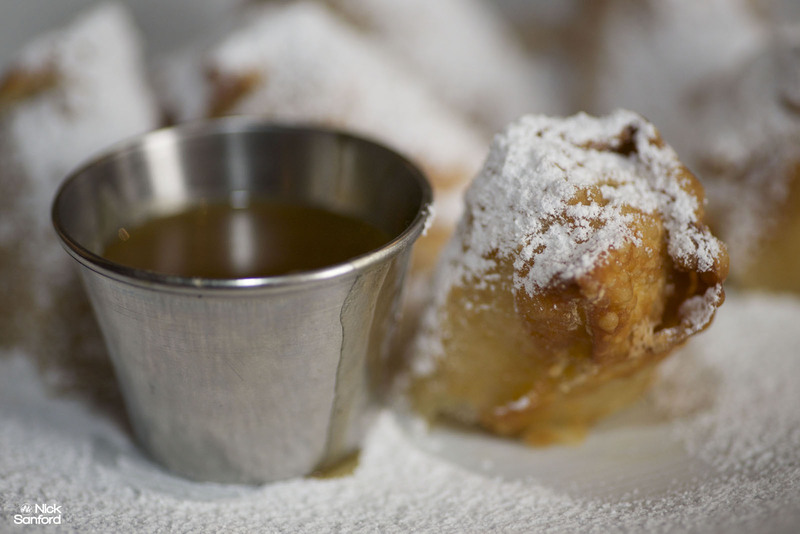 It’s Mardi Gra in your mouth. It is really hard for me to ever go to a brunch and not get my hands on some sort of Eggs Benedict. 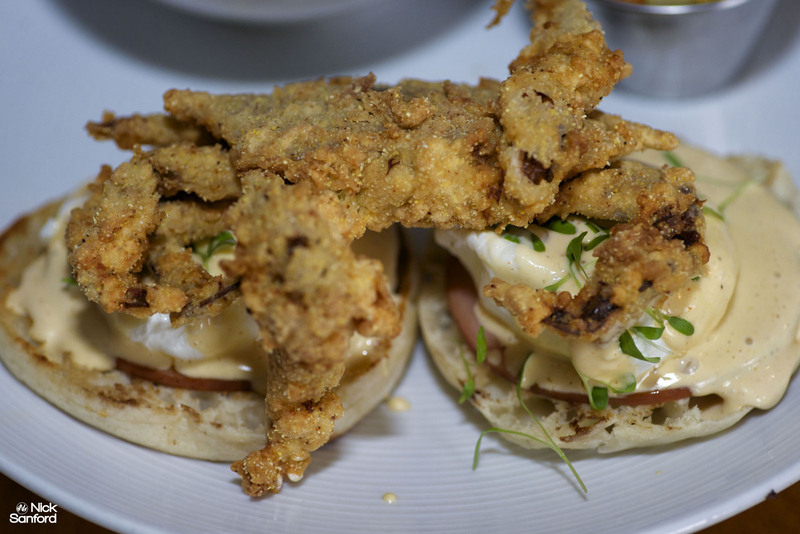 I usually go for the crab cake eggs benedict, but this time I saw one that had a soft shell crab. I wasn’t going to miss out on the soft shell crab benedict. No way. It was everything you’d hope for and then more. The yolk from the poached egg was all over the place as I had hoped for. A “must order” at Brick and Spoon. The Shrimp and Tasso Mac N Cheese was a big time hit at this place. I had to find out why. 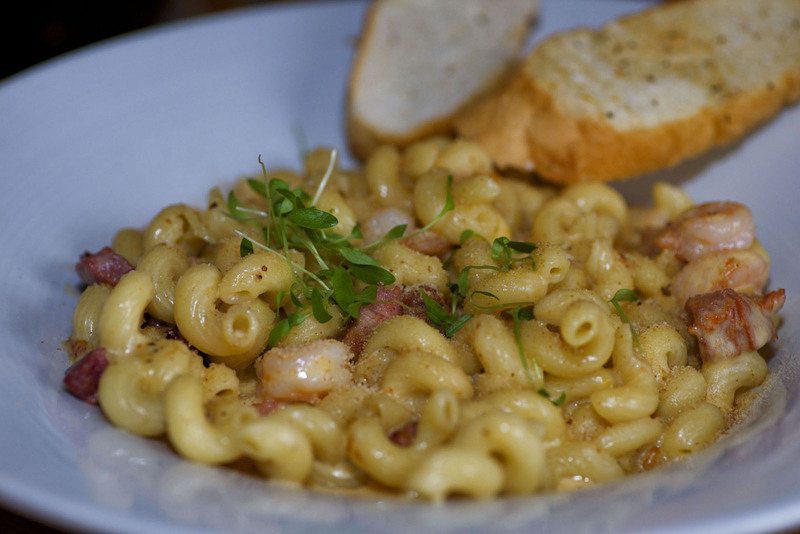 It’s made from gulf shrimp tasso, cavatappi pasta, smoked gouda mornay sauce and truffle oil. The Mac N Cheese was really nice and creamy like you want a mac to be. The shrimp and the ingredients mixed with the pasta made it a great addition to the trio of home runs that Brick and Spoon are packed with on every dish. It is a favorite of the chef’s as well. 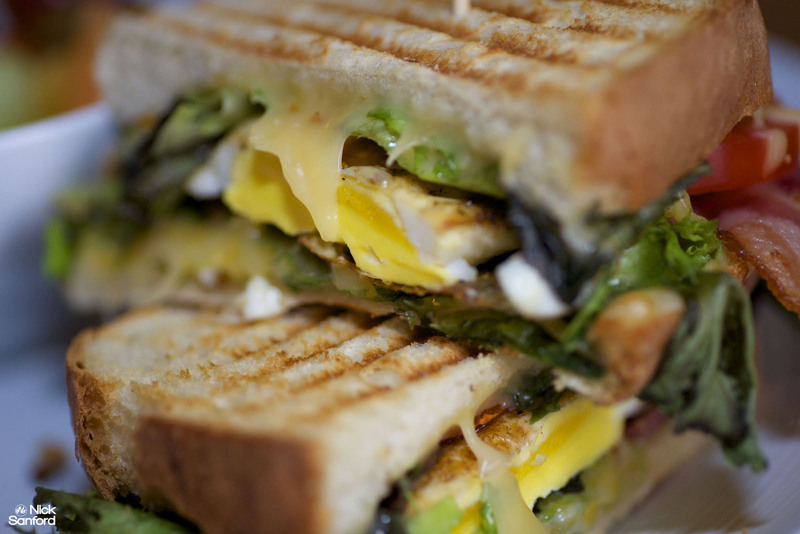 The Grown Up Grilled Cheese was a Panini sandwich that was delicious in every way. This is a grilled cheese delight. I’ll just let the picture of it speak for itself. The one thing you can’t ignore at Brick and Spoon is the awesomeness of their Bloody Mary recipes. You build your own and the best thing to do is to throw the kitchen sink at it and go to town. It was easily one of the best I’ve ever had. 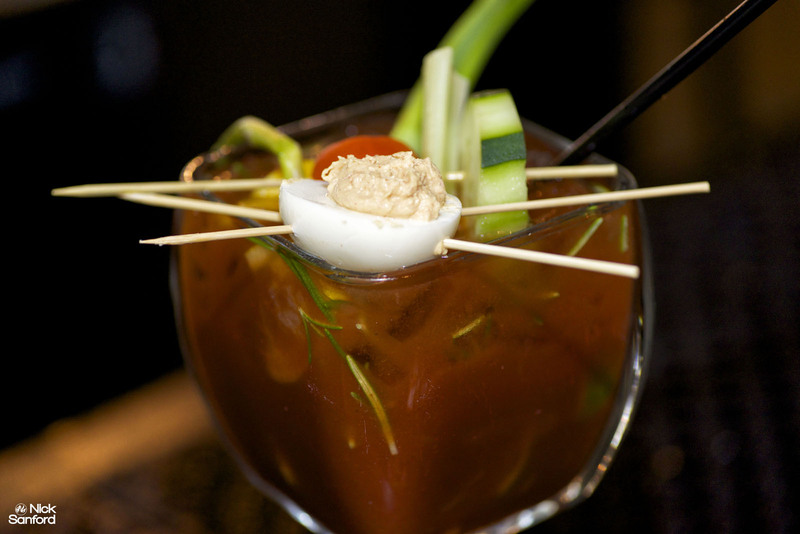 Make sure to enjoy a Brick and Spoon Bloody Mary and it will be just like having another meal on the menu. It’s another “must order off this menu. The southern Louisiana style of breakfast and lunch combined into so many intricate items on the menu is one of the best pleasures of a brunch you’ll ever encounter anywhere.